The warm weather is finally here, and if you are like many people, you are beginning to clean up your lawn. You may even be looking to make improvements to your property involving landscape architecture, including new walkways, patios, or walls. If this is something you’ve considered for your lawn, you are not alone! Hardscaping can make any yard or property look like a million dollars. The term is something that is not known by everyone, as hardscaping is its own category of landscaping. It usually consists of hard design elements such as stone, concrete, or brick. 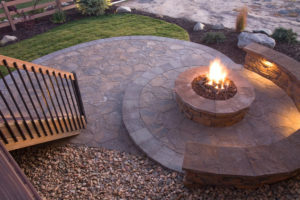 Some popular hardscape features include outdoor kitchens and living spaces, garden walls, paths and walkways, as well as the maintenance and repairs that come with the upkeep of such elements. Before deciding on a hardscaping design, think about your goal for your property. How do you want it to function? Would you like a space to entertain? To relax? A play space for the kids? The answers to each of these questions and others can help create the perfect hardscaping design for your home. What is the overall tone and energy you would like your space to emulate? Different elements in a hardscaping design (coupled with plants and other elements of landscaping!) can help to create the vision you always dreamed of. Texture, color, and finish of the materials used in your hardscape design will contribute to the energy of your space. You’re visualized your new entertainment space. You’ve found a shady spot for the kids to play. Unsure of what to do next? Ask the experts! A professional opinion on your design dreams helps bring your visualization to life, not to mention, helps you to work out any design challenges you would like to overcome. With a good expert opinion, your property design may come out even better than you imagined it would! At Greener Horizon in Middleboro MA, we understand how important hardscaping can be in contributing to the overall design of your landscape. When you need help deciding what landscaping work needs to be done prior to all of your summer parties and festivities, be sure to contact our expert team! Our team will walk you through our entire design process, and ensure that a project manager is available to you throughout our entire design and build process. Contact us today to schedule a complementary consultation!